Valuation of a building depends on the type of the building, its structure and durability, on the situation, size, shape, frontage, width of roadways, the quality of materials used in the construction and present day prices of materials. Valuation also depends on the height of the building, height of the plinth, thickness of the wall, nature of the floor, roof, doors, windows etc. The valuation of a building is determined on working out its cost of construction at present day rate and allowing a suitable depreciation. In this method, the net income by way of rent is found out by deducting all outgoing from the gross rent. A suitable rate of interest as prevailing in the market is assumed and Year’s purchase is calculated. This net income multiplied by Year’s Purchase gives the capitalized value or valuation of the property. This method is applicable only when the rent is known or probable rent is determined by enquiries. This method may be adopted when the rental value is not available from the property concerned, but there are evidences of sale price of properties as a whole. In such cases, the capitalized value of the property is fixed by direct comparison with capitalized value of similar property in the locality. This method of Valuation is suitable for buildings like hotels, cinemas, theatres etc for which the capitalized value depends on the profit. In such cases, the net income is worked out after deducting gross income; all possible working expense, outgoings, interest on the capital invested etc. The net profit is multiplied by Year’s Purchase to get the capitalized value. In such cases, the valuation may work out to be high in comparison with the cost of construction. In this method, the actual cost incurred in constructing the building or in possessing the property is taken as basis to determine the value of property. In such cases, necessary depreciation should be allowed and the points of obsolescence should also be considered. 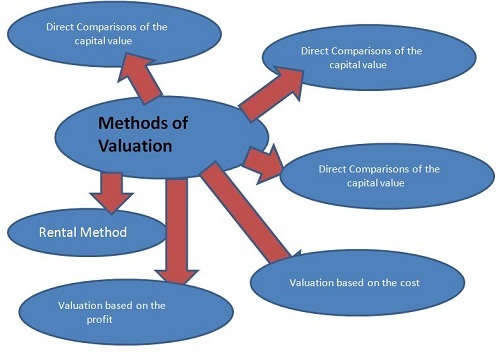 This method of Valuation is used for the properties which are in the underdeveloped stage or partly developed and partly underdeveloped stage. If a large place of land is required to be divided into plots after providing for roads, parks etc, this method of valuation is to be adopted. In such cases, the probable selling price of the divided plots, the area required for roads, parks etc and other expenditures for development should be known. If a building is required to be renovated by making additional changes, alterations or improvements, the development method of Valuation may be used. And the cost of each part should first be worked out on the present day rates by detailed measurements. The present value of land and water supply, electric and sanitary fittings etc should be added to the valuation of the building to arrive at total valuation of the property. You can subscribe for the updates. It is just a click away.